0 - Remo Stars and Wikki Tourists are the only teams with no red cards during the season. 1 - Plateau United claim a first-ever NPFL title in their 41 years existence. 2 - Kano Pillars goalkeeper Danladi Isah and Olorunleke Ojo while with Sunshine Stars before switching to Akwa United in mid-season saved the most spot kicks in single games. Both goalkeepers made two saves in single games. Isah stopped two penalties by Peter Iyamu and Sikiru Alimi in the game at Sunshine Stars while Ojo saved penalties by Ifeanyi Okoye and Sadiq Suleiman at Niger Tornadoes. 3 - Sunshine Stars won the most number of away matches. They won at ABS 4-2, Rivers United 1-0 and Remo Stars 1-0, that is one more than the other teams. 4 - Akwa United and Lobi Stars finished their campaign in the season with the longest clean sheets. They managed four consecutive clean sheets each. 6 - Abia Warriors striker Sunday Adetunji finished the season as the player with most individual goals on the road being six. Also, the hashtag #NPFLFinalDay17 trended in number six in Nigeria for longer periods, especially on the eve of the final, through Saturday and early hours of Sunday. 7 - Remo Stars finished the season with the longest run without a win at home. They went on a seven-game streak of no wins at home. 8 - Nasarawa United goalkeeper Suraj Ayeleso kept the longest back-to-back clean sheets in the season in home games. He did not concede in eight games on the spin. 10 - Kano Pillars striker Nyima Nwagua scored the fastest goal of the season in his team's 3-1 win against Sunshine Stars on Matchday 24 after just 10 seconds. 13 - Enyimba produced the longest winning run at home. They won 13 home games on the spin, two more than any other team. 14 - Relegated Remo Stars failed to win in 14 consecutive matches. That infamous streak lasted for 84 calendar days. 15 - Nasarawa United goalkeeper Suraj Ayeleso finished the season with the most clean sheets. 16 - Seven-time winners Rangers dropped the most points from winning positions. They dropped 16 points while in the lead in matches. 18 - Shooting Stars accounted for the highest number of individual goalscorers by a single club in the season. They had 18 different goalscorers, one more than other clubs. 19 - Lobi Stars striker Anthony Okpotu and Plateau United share this number. Okpotu scored his 19th goal of the season to finish as top scorer this season while Jos club Plateau United became the 19th club to win the NPFL - their first anyway. There were also 19 away wins in the season. 29 - Twenty nine matches ended without producing goals. 30 - There were 30 more goals scored this season than the 2015/16 campaign which recorded 735 goals. 34 - Plateau United spent 34 matchdays at the top of the NPFL, 30 more than any other club. 42 - Forty-two players got sent off in the season - either for second bookable offences or straight red cards. 44 - A total of 44 red cards were issued to players by referees during the season. 78 - Seventy-eight calendar days remain the longest period spent by any NPFL team in the season. That unsavoury feat was achieved by Remo Stars. 115 - There were more 1-0 scorelines in the season than any other scores. The 1-0 scorelines were repeated 115 times. 141 - Jos club Plateau United were unmoved at the summit of the league table for 141 calendar days. 145 - Remo Stars spent 145 calendar days in bottom place. 156 - Players on double figures of goals accounted for 156 goals of the 765 recorded in the season. 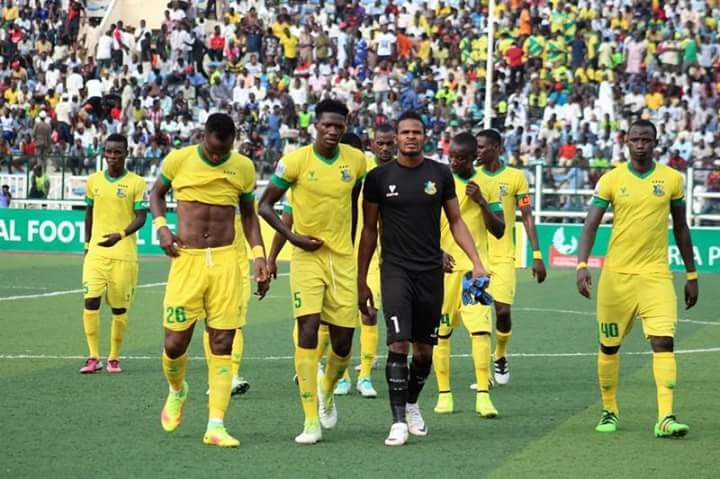 199 - NPFL champions Plateau United occupied top spot for 199 calendar days. 239 - The number of calendar days it took to complete 379 matches in the NPFL except for the Gombe United versus Wikki Tourists game which was abandoned. 260 - There were 260 different goalscorers in the NPFL season. They accounted for the 765 goals scored. 765 - The total number of goals scored during the NPFL season.